#EuropeForCulture. 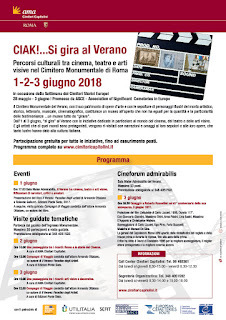 Within the framework of the European Year of Cultural Heritage, AMA Cimiteri Capitolini, the municipal company that manages the cemeteries of Rome, including the Verano Monumental Cemetery, joins the Week of Discovering European Cemeteries, promoted by the ASCE, with the program of cultural paths about cinema, theater and visual arts. The Verano Monumental Cemetery, with its rich heritage of art and with the burials of hundreds of illustrious figures of the artistic, historical, literary, musical and cinematographic world, stands as an open-air museum that is unparalleled in quantity and peculiarity of the testimonies. From 1 to 3 June, many initiatives are dedicated to the world of cinema, theater and visual arts. And the artists who are the protagonists of those worlds are re-visited with narratives and tributes to their tombs and their works, which have given Italian culture so much luster. In the collective consciousness, Rome is perceived also as the “city of cinema” and the program of the event wants to underline its uniqueness through the remembrances of its key figures: directors, screenwriters, actors, composers of soundtracks, etc., who have made the italian cinema great: Roberto Rossellini, Vittorio De Sica, Carlo Lizzani, Sergio Amidei, Alberto Sordi, Aldo Fabrizi, Vittorio Gasmann, Marcello Mastroianni, Eduardo De Filippo, Nino Manfredi, Nino Rota, Manuel De Sica… and many other artists buried in the Verano Cemetery. A reflection about the theme opens the program of the event, which includes the presentation of a novelty in the panorama of cemetery publishing: Verano. Artists' Paradise (Ponte Sisto Editions, 2017). Followed by themed guided tours about cinema, theater and visual arts in general, such as painting, sculpture, decorative arts. 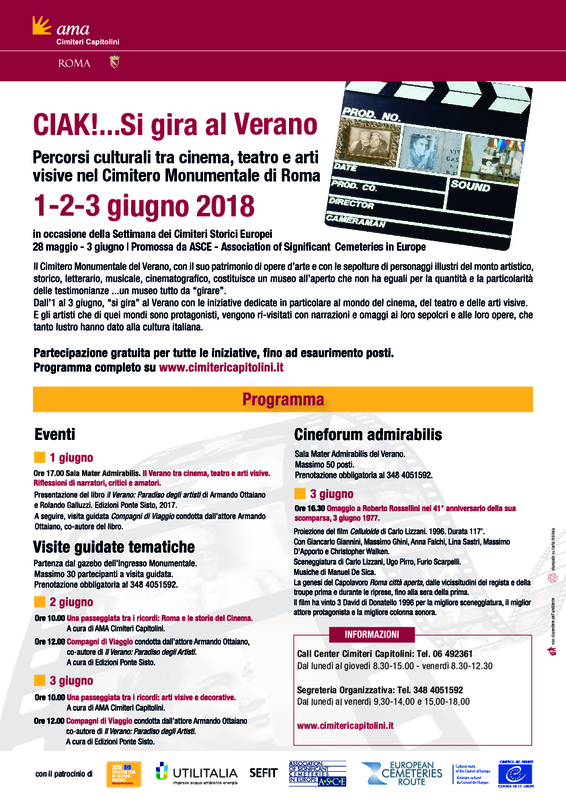 To conclude the event is the Cineforum Admirabilis, at the Sala Mater Admirabilis in Verano Cemetery, which hosts a special tribute to Roberto Rossellini, on the 41st anniversary of his death (3 June 1977), with the screening of the movie by director Carlo Lizzani “Celluloide”, the biopic dedicated to Rossellini and his masterpiece “Rome, open city”. 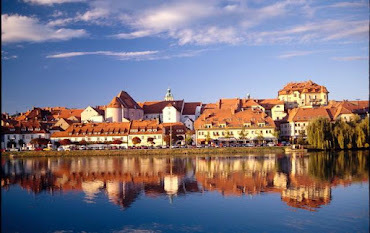 Free participation for all initiatives, subject to availability, with reservations required by contacting the Organizing Secretariat at the phone number +39 348 4051592.